A semipermeable membrane is a type of biological or synthetic, polymeric membrane that will allow certain molecules or ions to pass through it by diffusion—or occasionally by more specialized processes of facilitated diffusion, passive transport or active transport. The rate of passage depends on the pressure, concentration, and temperature of the molecules or solutes on either side, as well as the permeability of the membrane to each solute. Depending on the membrane and the solute, permeability may depend on solute size, solubility, properties, or chemistry. How the membrane is constructed to be selective in its permeability will determine the rate and the permeability. Many natural and synthetic materials thicker than a membrane are also semipermeable. One example of this is the thin film on the inside of the egg. Note that a semipermeable membrane is not the same as a selectively permeable membrane. Semi-permeable membrane describes a membrane that allows some particles to pass through (by size), whereas the selectively permeable membrane "chooses" what passes through (size is not a factor). 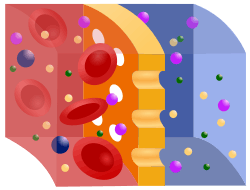 An example of a biological semi-permeable membrane is the lipid bilayer, on which is based the plasma membrane that surrounds all biological cells. A group of phospholipids (consisting of a phosphate head and two fatty acid tails) arranged into a double-layer, the phospholipid bilayer is a semipermeable membrane that is very specific in its permeability. The hydrophilic phosphate heads are in the outside layer and exposed to the water content outside and within the cell. The hydrophobic tails are the layer hidden in the inside of the membrane. The phospholipid bilayer is the most permeable to small, uncharged solutes. Protein channels float through the phospholipids, and, collectively, this model is known as the fluid mosaic model. Koros, W. J.; Ma, Y. H. & Shimidzu, T. (1996). "Terminology for Membranes and Membrane Processes (IUPAC Recommendations 1996)" (PDF). Pure & Appl. Chem. 68 (7): 1479–1489. See this document for definitions of penetrant (permeant), synthetic (artificial) membrane, and anion-exchange membrane. Rozendal, R.A.; Sleutels, T.H. ; Hamelers, H.V. & Buisman, C.J. (2008). "Effect of the Type of Ion Exchange Membrane on Performance, Ion Transport, and pH in Biocatalyzed Electrolysis of Wastewater". Water Sci Technol. 57 (11): 1757–1762. doi:10.2166/wst.2008.043. PMID 18547927. "High Flow Porous Membranes for Separating Water from Saline Solutions US 3133132 A". May 12, 1964. Retrieved 22 April 2014.